Ootah’s Luck Day – a 1970s play school classic! I was finally challenged on Facebook earlier today to list ten books which have influenced me. Normally, I am not enamoured by such tasks, but this one got me thinking…about what I actually remember, what stuck with me and what in some way shaped me. As I started to type, I became more and more aware of books which at different stages had an impact. I could have added dozens more, but it’s odd how a core stick. Perhaps it’s purely because they’re the ones I’ve taught in some way. I’m still hunting for a way to justify Ootah’s Lucky Day but I’m pretty sure I’ve mentioned it to at least some of my classes at some stage! Thanks Jenni for the nomination & hope that this is not too pretentious! Almost all were teenage as these days I don’t really remember most of what I read. Have stuck with novels/ fiction, most of which I force my students to read at some stage! In your status list 10 books that have stayed with you in some way. Don’t take more than a few minutes and don’t think too hard. They don’t have to be the right books or great works of literature, just ones that have affected you in some way. Tag 10 others once you’re done. 1. 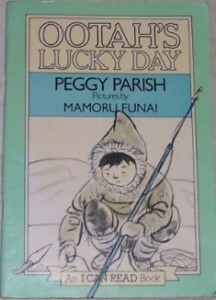 Ootah’s Lucky Day (If you haven’t heard of it….www.amazon.com/Ootahs-Lucky-Day-Read-book/dp/B000VBDL2W) by Peggy Parish. 2. The Outsiders – S.E. Hinton. Tough boys like poetry. Gangs, violence & Robert Frost in 1960s America. Classic teenage novel. 3. Kidnapped – Robert Louis Stevenson. The adventures of David Balfour in eighteenth century Scotland. From this, read lots of other Stevenson & learnt much about fine style. 4. 39 Steps – John Buchan. More adventures on windswept Scottish moors. 6. Cry the Beloved Country – Alan Paton. Exposure of apartheid in South Africa. Stunning, sweeping novel, rich in allusion, compassionate, angry and powerful in its message. Cannot recommend highly enough! 7. North and South – Elizabeth Gaskell. Love ‘condition of England’ type Victorian novels. One for those with taste in literature. Cleverly plotted, slightly sentimental but politically and religiously powerful. (Could have put here Howards End or the great 1960s reworking of the form The French Lieutenant’s Woman, the latter a novel I recently rediscovered). 8. Great Expectations – Charles Dickens. Not a light read, but many (ok, a very select few) of my students in retrospect have come to share my view that this is Dickens’ best. ‘Ever the best of friends, Pip old chap’…. My throat is getting a lump in it & my eyes welling up as I type. 10. A Sentimental Journey – Laurence Sterne. Selected for being representative of 18th century novels. Hilarious, witty, knowing writing. So here’s for the nominations…. As a teacher, this was an especially interesting exercise. All of these I’d read before university with the exception of Sterne and Gaskell. It struck me that many of these novels were at least in part about a search for identity (yes, The Catcher in the Rye almost made it!) but they chronicle also an awakening political conscience and growing interest in faith and its intersection with society.